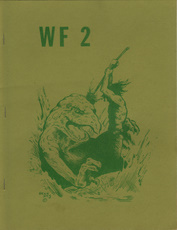 CONTENTS: Wanderlore (Questions from the players); Moving On (Optional Rules from the players); Prisoners; Movement After combat; Combat Results Table #2; Where the Puppeteer Troup Starts, pt.1; Translation (from A History of My Black Horse Troop); New Pieces Keener Than; Hungry Jack; The Hydra; Master of Magic); more. ARTICLES: Wanderlore - Questions from readers; Moving on - Suggested rules from players; The Carving of Tarsh, History; The Harlot of Alone, Translation by Ron Nance; The "Final Errata"; Character Statistics in Role Playing WB&RM, by Dave Hargrave; Prince Argrath's Entry into Boldhome; Walktapus Cooking; more. ARTICLES: More on Nomad Gods; Exotic Abilities for Nomad Gods; Medley of New Units; Fadabius Letters; Geedunk Dungeon; A village Near Alone, by Greg Stafford; Elric! 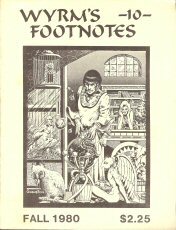 Notes & Additions; Gods & Goddesses of Glorantha, part 2; Dark Trolls; more. 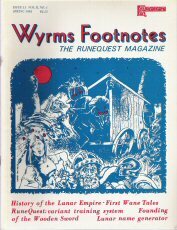 ARTICLES: History of the Dark Trolls by Greg Stafford; Rambling Rune by Steve Perrin; Greater Deities; Sporewood; Languages of Dragon Pass; more. 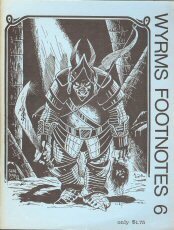 ARTICLES: Pavis Notes, New Monsters by Steve Perrin; Sartar High Council by Greg Stafford; Back to Boardgames; Map of the Lunar Empire by Greg Stafford; Gods and Goddesses of Glorantha - Deities of Darkness; Sartarite Magic Regiments by Ray Turney & Greg Stafford; Troll Ball by Greg Stafford; more. 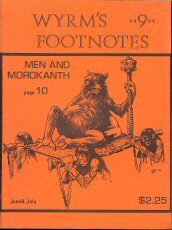 ARTICLES: Gods of the Earth, part 5, by Greg Stafford; Mini Scenario, by Denis Sustare; Men and Morkanth, by Elizabeth A. Wolcott; New Tables for Runequest; Dragon's Past - Adventures from Greg Stafford's Dragon Pass Campaign; more. ARTICLES: Rune Masters - Corrections and Additions by Steve Perrin; History of the Lunar Empire - Part One, Birth of the Goddess to the Rise of the Red Moon by Greg Stafford; Gods of Fire and Light - Chapter Six of the ongoing series Gods and Goddesses of Glorantha; Engage and Destroy - Changes, Clarifications, and Additions by Chris Kurzadkowski; more. 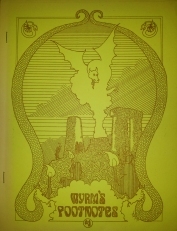 ARTICLES: RUNEQUEST VARIANT TRAINING SYSTEM by Lee Gold * ADVICE FROM RURIK edited by Steve Perrin * PLUNDER by Rudy Kraft * LUNAR NAME GENERATOR by Paul Jaquays * DRAGONS PAST stories of our house RuneQuest campaign * PERSONALITY OF GLORANTHA Londra of Londros * HISTORY OF THE LUNAR EMPIRE part two — the First Wane by Greg Stafford * GEOGRAPHY OF GLORANTHA the Sea of Neliom * THE RIDDLE MAN by Morgan Conrad * GODS AND GODDESSES OF GLORANTHA gods of Light - Yelm by Greg Stafford * more. ARTICLES: GODS AND GODDESSES OF GLORANTHA, PART VIIa: The Gods Of Storm. Includes Umath, Kolat, Brastalos, Storm Bull, Vadrus, Gagarth, Iphara, Molanni and Humakt. Also includes minotaur Berserker Rage rules. 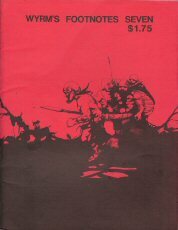 By Greg Stafford * DRAGONS PAST Rebellion in Sartar! A local skirmish erupts into war as Wilms Church and Jonstown are liberated. An Heir to the throne is found! * PERSONALITY OF GLORANTHA: Fazzur Wideread, Governor General of Dragon Pass. Full statistics on the commander of the occupying army of Dragon Pass. By Greg Stafford and Charlie Krank * DIVINATION & DIVINE INTERVENTION House philosophy on the use of Divination and Divine Intervention as we use them in RuneQuest * HISTORY OF THE LUNAR EMPIRE: Second Wane. Covering the Empty Conquest, Bindle Wars, and the Conquering Daughter Campaign. By Greg Stafford * THE CULTURES OF GLORANTHA:THE AGIMORI (the tribe of the Men-and-a-half). Feature article describing the culture and characteristics of the Agimori for inclusion in any RuneQuest campaign * more. 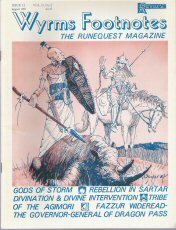 ARTICLES: PANTHEONS OF GLORANTHA - The first in a of articles to replace the Gods and Goddesses series. Pantheons will go into more detail than the old series. See this issue's editorial for more information. 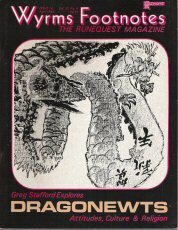 By Greg Stafford * GEOGRAPHY: QUESTWORLD Presenting a new world for RuneQuest, Stormbringer, Call of Cthulhu, and Worlds of Wonder play. 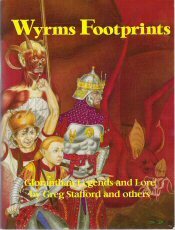 By Lynn Willis and Greg Stafford * PERSONALITY OF GLORANTHA - At last! That famed Rune lord of Yelmatio: Rurik Runespear * DRAGON'S PAST - Follow the exploits of Red Bird on his trip to visit Cragspider * HISTORY OF THE LUNAR EMPIRE - the Third Wane. The tale of the Barbarian Invasion. By Greg Stafford * RUNE-GLITCH — Troubled by spirits in your Rune-Quest game? 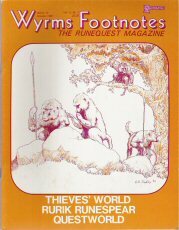 This new feature by Tom Holsinger uncovers the problems with the spirit rules and suggests ways that you can solve them * OUTWORLD CHARACTERS IN THIEVES' WORLD How your character fits into the Thieves' World game supplement * WHAT IT TAKES TO "CONVINCE THE EXAMINERS" — The RuneQuest rules for admission to Rune status are nice, but what does it really take in the world of Glorantha? By Greg Stafford * more. ARTICLES: DRAGONS PAST Leika Ballista undertakes a quest to become the King of the Colymar. By one who was there! * RUNE GLITCH Tom Holsinger impales, slashes, and crushes our rules to bits * THE DRAGON PANTHEON Everything known about dragonewts, including new Personality Traits, weapons, skills, and spells. * DRAGONEWT PERSONALITIES * HISTORY OF THE LUNAR EMPIRE The Fourth Wane: The Strong-Making Peace. By Greg Stafford. * THE LAST WORD One final message to the readers from Greg Stafford * more. GODS & GODDESSES OF GLORANTHA - an in-depth look at each of the major pantheons of deities, updated and expanded from the original. WALKTAPUS COOKERY - try out Beat-Pot Aelwrin's own secret recipes. THE SARTAR HIGH COUNCIL - a playable supplement detailing all the important personalities of the rebellion. TEMPLE OF THE WOODEN SWORD - the story of the most famous Humakti temple in Dragon Pass. FULL STATISTICS for Jar-Eel the Razoress, Harrek the Berserk, The Red Emperor, and others. 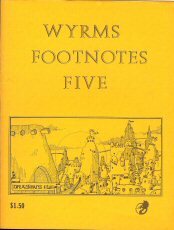 ...plus original artwork of the famous sights of Dragon Pass, and many more articles, some of them unpublished even in Wyrms Footnotes!"